N-VA, Positief Hove , local independent. Hove (Dutch pronunciation: [ˈɦoːvə]) is a municipality (gemeente) located in the Belgian province of Antwerp. The municipality only comprises the town of Hove proper. On January 1, 2006, Hove had a total population of 8,307. The total area is 5.99 km² which gives a population density of 1,388 inhabitants per km². 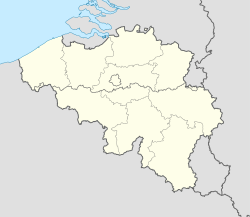 The municipality lies approximately 9 kilometres (5.6 mi) from the city of Antwerp, the capital of the province. It is a small community, and is said to be one of the most expensive areas in Belgium. Many people pay large sums of money to live there because it is one of the safest places in Belgium. Van Den Weygaert, Luc. "Hove in de wereld" (Hove in the world), Edit. Ouderits, Hove (Antwerp), 2010, 26 p.
Van Den Weygaert, Luc. "Hove, culturele en toeristische verkenningen", Edit. Ouderits, Hove (Antwerp), 2012, 24 p.
Van Gysel, Albert. "Bijdrage tot de geschiedenis van Hove" (The History of Hove), Edit. Jos Verheyen, Boechout (Antwerp), 1957, 80 p.
This Antwerp location article is a stub. You can help Wikipedia by expanding it.